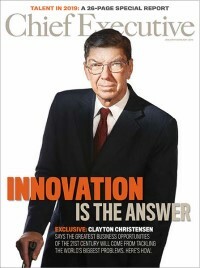 In their book, The Game-Changer, P&G CEO A.G. Lafley and noted author and business advisor Ram Charan observed that “to prosper, companies need to do four things well: develop leaders of the future, improve productivity, execute strategy and create innovation.” Arguably, the first step must be done well if the prospect of succeeding at the remaining three steps is to have any chance of success. Each year since 2005, Chief Executive has sought to identify those companies that excel in leadership development. In partnership with Chally Group Worldwide, a Dayton, Ohio-based sales and leadership talent-management firm, and with the Human Capital Institute, we canvas world-class companies through a questionnaire and interviews in order to learn what companies are doing to identify and nurture people three or more levels down the chain from the CEO. The final, top-40 ranking consists of public companies with over $1 billion in revenue, and the top 10 on the list scored within several points of one another. Rankings are affected by a company’s reputation among its peers, as a source for well-rounded talent. The percent of senior management recruited from internal talent pools is another criterion. Similar to 2013, some attrition among last year’s winners accounts for why previous winners did not appear on the 2014 listing. As a clear indication of the escalating importance of leadership-development processes, half of the companies on the 2014 ranking are new to the list. P&G once again tops the list as the Best Company for Leaders, with IBM coming in second at just a fraction below and GE moving to a No. 3 ranking. These three, leading contenders have different but parallel methods of developing talent. P&G and IBM, for example, place a premium on developing people from within. All of P&G’s senior managers are judged on their abilities to develop those who report to them. Development includes both formal as well as informal training. Lafley himself mentors a group of high achievers several levels below. He also monitors the company’s top 300 executives and ensures that they are inculcated with the values of the firm. Likewise, IBM identifies those with early promise under its Basic Blue for IBM Leader program, where leadership competences are explored and guidance for career paths is given. As one might expect from a company of IBM’s pedigree, nearly everyone is tracked assiduously. IBM’s Chairman/CEO Virginia Rometty, like her predecessors, follows a range of specific individuals at all levels with “Chairman’s Reviews” with action follow-ups. New to the top-10 ranking are Accenture (4), Unilever (5) and Hormel Foods (9), which report impressive leadership-development processes. Of the companies surveyed, 84 percent have headquarters in North America and 57 percent have international operations. The majority of industries represented included Professional, Scientific, and Technical Services (21 percent), Manufacturing (19 percent) and Finance, Insurance, Real Estate (14 percent).